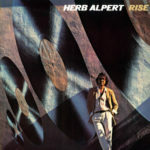 The Rise album was conceived in 1979 after the worldwide success of both the 7″ & 12″ versions of the single “Rise”, a song written by Andy Armer and Randy Badazz Alpert which became a #1 million selling hit song on sales charts, radio, and in dance clubs throughout America, Europe, and Japan. Side One began with the song, “1980”, an instrumental theme written by Herb Alpert which NBC Sports executive Don Ohlmeyer had originally commissioned for the network’s planned coverage of the Summer Olympics in Moscow, but was used seven years later for as the official theme song for NBC’s telecast of the 1986 FIFA World Cup in Mexico. Song number 2 was the title track, “Rise”, a #1 hit written by Andy Armer and Randy Badazz Alpert. Song number 3 was, “Behind The Rain” written by Herb Alpert. The closing song on Side One is another Andy Armer and Randy Badazz Alpert song called “Rotation”, which was a Top 30 follow-up single to “Rise”. Side Two included a cover of “Street Life,” originally recorded by The Jazz Crusaders, a version of the Bill Withers song “Love Is” featuring Alpert’s vocals, as well as a dance rendition of Joaquín Rodrigo’s “Aranjuez” classical composition. Rise was the first album to be recorded digitally on the 3M 32-track digital recorder at Alpert’s A&M Records studios. The album eventually peaked at #1 on the Billboard Jazz Album chart, and at #6 on both the Billboard Pop 200 and R&B Album charts and sold over 3 million copies. Published By – Blue Beard Music Ltd.